"Tasty salad with a nice kick. It's juicy, crunchy, and good!!!!!" 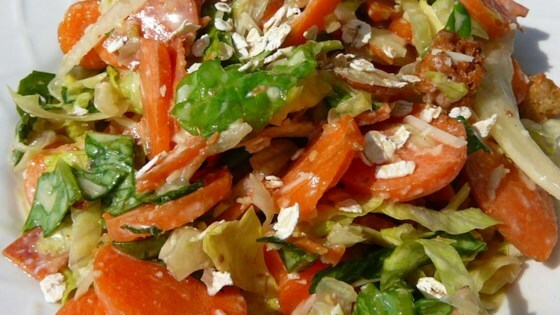 Toss the carrots, pepperoni, almonds, and lettuce together in a bowl; top with the Parmesan. Drizzle the lemon juice and vinegar over the salad. Scatter the croutons over the salad. Spread the Caesar dressing over the top. Sprinkle the oatmeal over the salad to serve. See how to make a classic salad with garlic croutons and a creamy dressing. We tried this because of the interesting combination of ingredients, and it was quite good. My husband and I liked this recipe. It does get a little watery though, but it makes a good side dish.